The see-now-buy-now factor plays a big role these days with everything going digital. That includes your optical store too when it comes to getting your eyes on those sleek new eyeglasses you came across the other day. 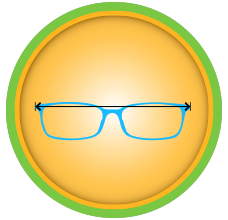 Besides knowing your Pupillary Distance, you would also need to know your frame measurements to get it right the very first time you buy that pair. Read on to see how you can get your number easily. 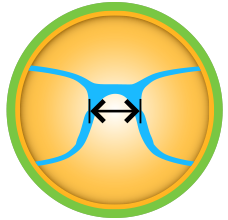 When deriving your frame measurements, the frame width, lens height and width, temple arms and bridge are what you need to look for which is technically everything. What exactly does each one of this mean? The total distance from the extreme left to the extreme right. The distance of the lens from top to bottom. The measurement in between the lenses. 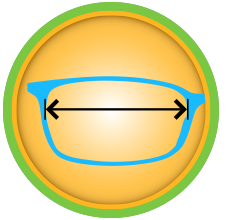 The horizontal distance of one lens. The length of the temple arm including the part that rests behind the ear. If you already have the perfect eyeglasses in hand, simply look to the frame dimensions that are printed on one side of the temple arms, following by the lens width, bridge and temple arm length all in millimetres. Now all you need is just the frame width which is usually not printed on along the other measurements. Keep on scrolling to find out how you can get it. If you seem to be missing the numbers on your glasses, all you need is a millimetre ruler or a measuring tape to get your measurements. Measure the horizontal distance in frontal view including any pieces which stick out at the sides. 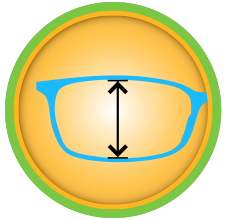 Measure the horizontal distance in between the lenses from one end to the other. Measure the horizontal distance from the bottom side of the frame to the end of the arm ending behind the ears. Measure the vertical distance of the lens. 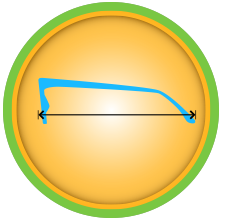 Measure the horizontal distance of the lens.